2013's breakout success - Ryan Coogler. He swept the awards at Sundance this year, with Fruitvale taking home both the Grand Jury & Audience Award, then went on to play Cannes to a standing ovation. Next stop, Oscars? Well, before we get to that, it's time to catch up with the man behind it all, Ryan Coogler himself. I've been looking forward to talking with him ever since first seeing Fruitvale during Sundance. I finally got the chance to catch up with Ryan and chat about the film on the beach at the Cannes Film Festival this summer. The interview was recorded on a Flipcam and gives a good introduction to the story. Watch below. We recorded right on the beach near the Palais, so it may get a bit noisy but not too bad. I was a bit gushy with Ryan and his film, but it's a moving film and I wanted him to talk openly about it. We covered a range of topics from casting to cinematography. Ryan is 27 years old and attended USC's School of Cinematic Arts. If you haven't seen Fruitvale Station yet, watch the official trailer here and read Ethan's initial review of it. Ryan Coogler's Fruitvale Station is set for a limited release from The Weinstein Company starting on July 12th this summer. See it at a film festival or in select theaters near you this year. 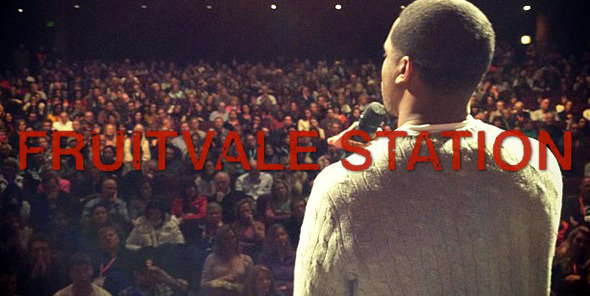 Follow @fruitvalemovie.